In an anatomy lesson with Leslie Kaminoff this week, he discussed gravity…the silent, all pervading force that is pulling every atom of matter strongly towards the center of the earth. Gravity is good. It provides stability. The pull, which is constant, everywhere, and seemingly everlasting, can sometimes make us feel heavy and tired. Like we are made of cinder blocks, not light organic yogi handstand material. Whether we are feeling light or heavy at the moment, we all seem to be on a search for a relief from the enduring pull towards the dark center. The obvious question is… If the force is so strong, why do we not in fact get sucked into the core mass of the planet? The answer lies in our perpetual quest to be ‘relieved’ of the gravitational pull, aka LEVITY, which (my fave ‘take’ on it) has been called “the pursuit of lightness of foot and heart” by Elder Lindhal. In yoga and meditation, the simple seated asana (which, if you sit regularly, you know can be one of the most challenging of all yoga postures to maintain with integrity) we want to find a balance between these two natural forces. We want our pelvis and lower body to descend and our spine, torso, neck and the bowling ball that sits atop to ascend–effortlessly. Often, we have the opposite happening; we’ve got knees and groins ascending. Our chest, shoulders and spine are heavy and collapsing. And somehow we find ourselves TRYING SO HARD to just sit peacefully. WTF? These common tendencies cause inner discomfort, anxiety, torture, etc. Discomfort in meditation = inner turmoil and deafening ‘bad’ voices. Soooo not nice and defeating the purpose of meditation all together. What is utterly fascinating about gravity and levity is that they are forces of nature…not of human doing. We simply have to surrender to the divine order of the Universe, turn in, refine or connection to the earth, become a willing participant and vessel or the life force energy to move through and within us and trust nature to do her thing. We have no authority over the forces, only the deep inner wisdom that, if we follow it, guides us to participate skillfully with them. This principle of aligning and co-participating with the forces of nature does not just apply to the seat of meditation. The laws of nature live within us and apply to all of the actions that we take in our bodies whether on a yoga mat or out in the ‘real world’. In yoga we call it ‘root down to rise up’, or ‘create balanced action of muscle and organic energy’, or ‘press into the earth and feel the rebounding energy arise within you’. In life we call it equanimity. It’s all gravity pulling us to the center and holding us steady as levity (also called support) counters it by pushing an ascending energy up through us with as much force. It is ultimately balanced, divinely designed, and absolutely F#*~ING BRILLIANT! We’re exploring gravity, levity, and ‘lightness of foot and heart’ all week in my asana classes. Expect more pranayama and meditation too! If I don’t see you on a mat…..May the Forces be with you. I preface this blog post with an apology to those of you who don’t care or don’t know about the recent scandal surrounding John Friend, the founder of Anusara Yoga, the school in which I have trained, practiced, and have affiliated myself with since 2004. As the only licensed Anusara teacher in Alabama, it would be irresponsible of me to disregard, ignore, or avoid addressing the situation and how it affects me, my teaching, and Yoga Birds.In short, the recent crumbling of the Anusara community (due to serious alleged and proven charges against John Friend’s behaviors and abuses of power) does not affect me, the way I teach, or Yoga Birds in any way–other than it makes me sad to see my friends and colleagues suffer and it makes me angry that John Friend has tarnished the reputation of yoga in general. I firmly stand by the method of implementing (in practice) and articulating (in teaching) the 5 Universal Principles of Alignment that were set forth as the foundation of asana practice in Anusara. I know from experience (good ones and not so good ones) and 16 years of unwavering studentship that the Anusara alignment principles make asana safe, therapeutic, and accessible for the masses (of course there are always exceptions and anomalies when dealing with a fluid human body). I will continue to hold the space to teach yoga using the elegant alignment principles because they work and more importantly they heal. Asana practice without attention to alignment will eventually (if not quickly) erode and injure the human body. The Anusara alignment principles empower folks to learn and practice taking skillful actions in asana that create the conditions for optimal energy flow in the body. The principles of alignment heal the body, strengthen the body, create appropriate flexibility in the body, and radically awaken the innate intelligence of the body that is within every person. Every person can have an intelligent body (free of suffering) if one chooses to wake up and find their unique optimal alignment. I will continue to teach in the same way I have always taught, (in my humble opinion) with clarity, creativity, sometimes challenge, and always with a light heart and a sense of humor. As always, my teaching will evolve as I continue a steady home practice, and diligent, dedicated studentship. I will continue to be an asana yoga student of my teachers Christina Sell and Noah Maze. They have both (along with over 100 other Certified and Inspired Anusara Yoga teachers) resigned their licenses with Anusara, Inc. I will embark on a 500 hour training with Christina Sell this year through the School of Yoga that she and Darren Rhodes have created (and Noah has joined them). 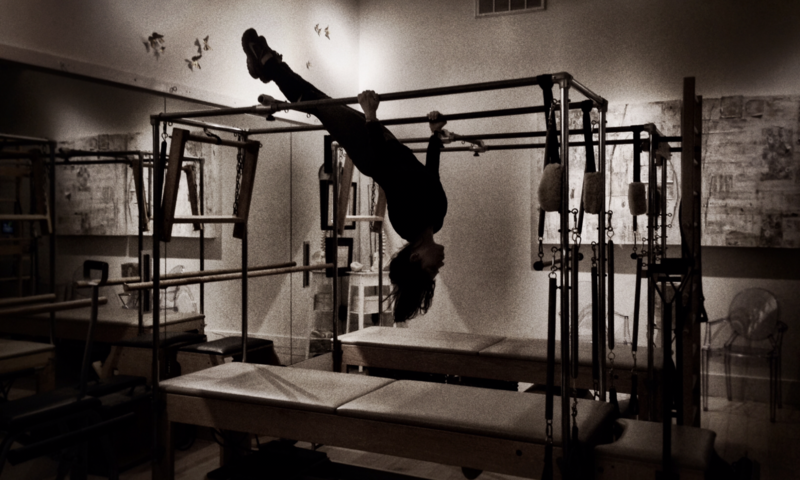 I continue my anatomy studies with Leslie Kaminoff of the Breathing Project in New York. 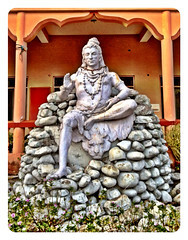 I am overjoyed to begin studies in Kirtan and Bhakti Yoga with Daniel Tucker founder of Kirtan Central in Berkeley, CA. And for my 40th birthday this year I will finally make a long awaited trip to the Chopra Center in California for an in-depth Ayurveda treatment (panchakarma) and study other Ayurveda practices. Evolution is a wonderful ride. I am grateful for every moment on the path, for learning to ‘go with the flow’ (instead of constantly swimming upstream) is truly a daily practice and commitment to the Self. Truthfully, my last two experiences as a student with John Friend were unfulfilling and frankly baffling in some instances. I felt my time, money and energy in this arena of yoga (asana and teacher training) would be better spent studying more with Christina and Noah. And so it will be. I am very proud of all of the hard work and training that it took to become Anusara-Inspired. My understanding and practice of asana has advanced more than I could have ever imagined. Through the healing and therapeutic Anusara practice, I experience more joy and less suffering in this body now than I did as a child, teen, or young adult. For that, I am forever grateful to Anusara yoga and to John Friend for his brilliant articulation of the method early on. I consider it a huge achievement and a great honor to have been in the company of so many great yoga teachers who are/were Certified and Inspired Anusara teachers. I do not feel the need to ‘officially’ resign as so many of my colleagues have done. I will not renew my license with Anusara (if there even will be such an entity) this year and I will cease to call myself an Anusara-Inspired yoga teacher. I just got a zillion new business cards with the Anusara-Inspired tag, and I will probably continue to use them so as not to waste paper. I actually consider myself an ‘Anusara, Iyengar, Astanga, Jivamukti, Bikram, Bahkti, Muktananda, Bhagavad Gita – Inspired’ Yoga Teacher. That’s a little too much of a mouthful and doesn’t look very pretty on a business card. Why don’t we just call it CERTIFIED GUMBO YOGA? I WILL make that business card! Thanks for taking the time to read this. I awoke this morning feeling like myself, just a bit weak and dehydrated. A normal morning of shower and breakfast happened which I am ever so grateful. After being so ill, I have renewed gratitude for the little things. Not wanting to waste a day in India, I hired a car to take me into the city for some last day shopping for friends and family at Kahn Market. Just driving around in this foreign city, I gape out the window with the woderment of a child at EVERYTHING. Indian customs and standards are so different from home. The standard of cleanliness is one that is hard to get over, but you do. The custom of wearing beautiful saris on a daily basis is intriguing and beautiful. There is a sense of constant chaos here…on the roads, in the train station, in the markets…yet everything moves forward. People get to work, children get to school, the sun sets and the moon rises just like everywhere else. There are domestic problems, poverty, crime, and devastating pollution. There has been an upsetting election, there is scandal in Bollywood. In some regards it is not so different here, yet it is utterly foreign. This is why I love to travel. The importance to meet and know people of other cultures and see how they live is vital not only to reinforce the fact that we are all brothers and sisters on this planet, but also to validate our our place and path. For if we have nothing to base or compare our life’s existence on but the small worlds we create in the patterns of our everyday lives, we might miss out on a life full with meaning and happiness. We must know more of the world to know more of ourSelves. Today I love Mother India and her kind hearted people, her dust and all the craziness, her strange take on efficiency and her rich Spirit. And today I couldn’t be more happy to be departing this city of 13 million, and country of 1.3 billion for my small hometown of 24,000ish, my mom’s gumbo, green Vitamix smoothies, my sweet sweet yoga community, and my colorful many legged extended family on Echo Lane. All One. All Love. I preface this blog post with a disclaimer that it may be a bit ‘graphic’ or gross for you. But I have to write it how I see it tonight. 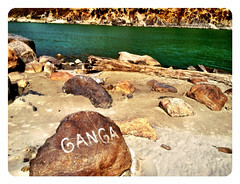 Yesterday I was in beautiful Rishikesh, meditating on a rock by the Ganges River. The world and my place in it felt expansive, breezy, and bright. Within 14 hours, I am doubled over with painful stomach cramps and severe nausea in a decent, clean (Indian standards) airport hotel. I am in Delhi, sick again with awful throwing up. My travel group had to proceed on to Agra without me, as our 9am departure time found me paralyzed with painful stomach cramps, sure to vomit again soon. And so it happened. I kept throwing up in Delhi and they left on a 5 hour bus ride to the Taj Mahal. I am a little bit sad to not be able to go with the group, but really just dealing with my current state of health in this moment. There are lots of tools like yoga and meditation that whip us right into a state of awareness of NOW. Being desperately sick on the wet floor of an Indian bathroom (because most showers do not have curtains and the floor level is the same throughout the whole of the bathroom) snaps me into the present moment. All I can do is say, ‘inhale, exhale, and oh God’. And I mean it. I know that the Lord is with me, holding me. And I know I will be OK. With each breath I am grateful to be alive and I feel blessed. Then I throw up again. Seems odd to feel blessed in such a moment. It was really a disgusting and pitiful scenario. At The Yoga Fest, in one of the spiritual lectures, the subject of distinguishing between pain and suffering was discussed. Sadhvi Bagavati said (and I summarize) that ‘in our lifetime of embodiment there will be blood, we will fall and break bones, we will get sick and experience pain. These things happen and we do not have a choice in the matter. But the prolonged suffering of these situations and events is a choice.’ It might be like while I am violently sick I would exacerbate it by trying to blame someone or something for my sickness, or to be angry that my body is reacting a certain way. Blame and anger would only make the already painful and unavoidable situation worse. Why would anyone choose to make it worse? But that happens often. In retrospect I look back a few hours on my wretched morning and feel good about where I am in my relationship to God and Self. 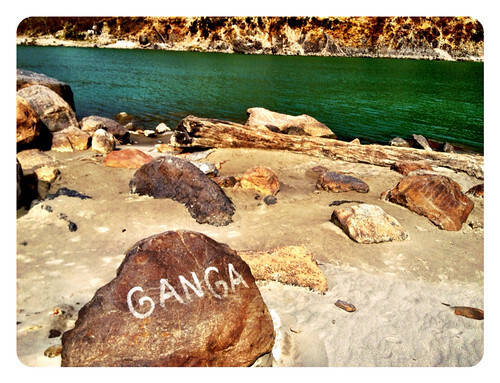 Maybe it is because I have been at an ashram for a week practicing yoga, singing mantras, and meditating so near to Mother Ganga. Who knows…. Back to earlier this morning….As soon as I start feeling a little better I arrange to move to a much nicer hotel down the street that is geared toward international business travellers. And as all things in India are done in a round about fashion, I have a travel agent book the room, who then faxes a voucher to my current hotel. The voucher is what I use to check into the next hotel. Current hotel books a pre-paid taxi. I miraculously pack my suitcase, dress myself, and even manage to apply a tiny crystal bindi to my forehead. Interestingly, I find that if I dress more in the way of Indian customs, folks are more eager to help me. 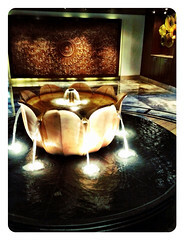 As I leave the DeeMarks Hotel, which our travel group has used as a hub in Delhi, I admittedly am happy. I am looking forward to the gleaming marble floors and vast high ceilings and the spa and the Western restaurants at the Radisson. The driver informs me that we will drive the wrong way down the 3 lane service road (to the 10-lane highway) since the hotel is only a mile away. Otherwise we have to go very far in the wrong direction to turn around. So we drive for a mile with rickshaws, cars, trucks, bikes, and pedestrians coming at us head-on. It is total horn blowing, dust flying chaos, but doesn’t phase me at all and actually makes me spontaneously giggle. It’s ‘just India’ to me now. I feel slightly better as I enter the hotel. I thought I might faint at check-in but made it through and have a beautiful room with all the creature comforts of Western luxury. Spoke to my mom and my husband and ate some French fries and had a 7up. After speaking to mom, I am encouraged that I will return to India with her and see the Taj Mahal (have been twice now and haven’t seen it). Haven’t been sick again since I arrived which is a good thing. I am so grateful for this life and every experience that weaves the tapestry of my existence. And I am very happy to be on my way hOMe tomorrow. do it for the betterment of the planet or mankind, and do it for a long long time. Make it a path. The important thing is that we respect the paths of others and remember…I know you, you know me One thing I can tell you is you got to be free. Come together Right Now! 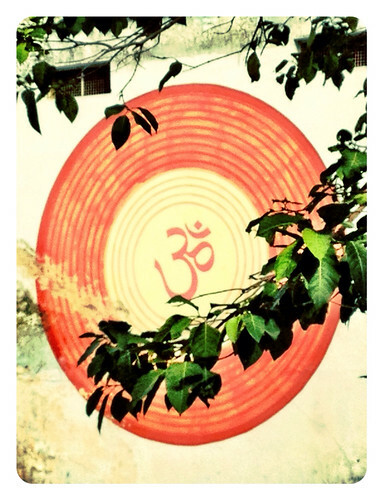 Peace Love Yoga and Rock-n-Roll from India. 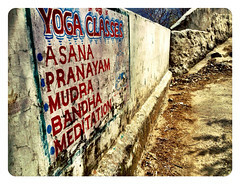 We take the heart of the mountain into our own hearts as we leave Dharamsala today. On the way out of McLeod Ganj, there is a flurry at the entrance to Dalai Lama Temple. He is on his way ‘home’. People line the street on both sides as we leave the village. A quarter way down, our cars pull over per police direction. Outside the cars we cross the street in just enough time to make way for the motorcade. 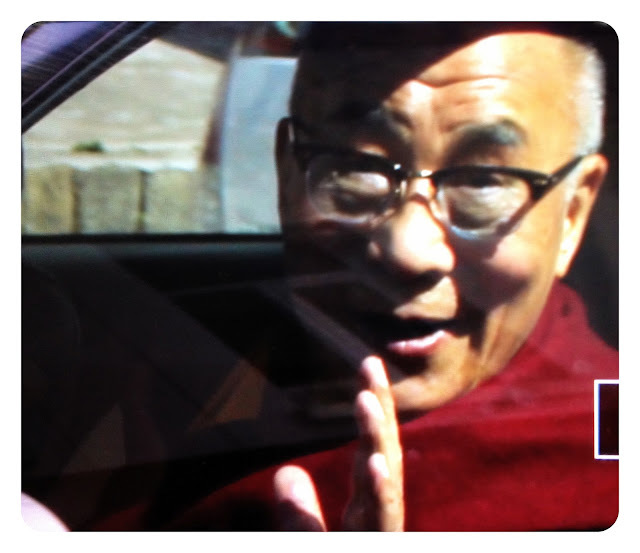 In a flash the Dalai Lama passes in his car and waves to us. Giddy. Star Struck. Elated. Just plain Happy Buddha. We are SO lucky. I can’t believe it! To see His Holiness the Dalai Lama in Dharamsala is really a dream come true. By 9pm we have arrived back in Delhi. We visit my friend Inni Singh at Delhi Music Store where the group buys 3 more harmoniums. We are a group of 8 carrying a total of 4 harmoniums. Beautiful Music!! We are totally a band. 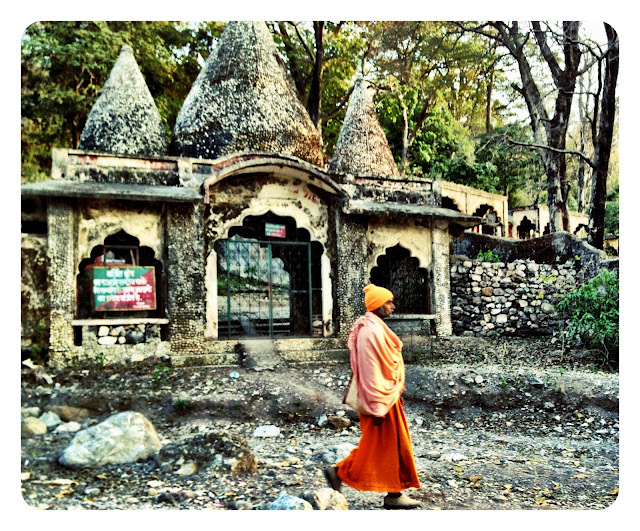 Currently we’re on a bus to a one night hotel near the New Delhi Railway Station and head to Rishikesh for the yoga festival tomorrow. I haven’t mentioned that I have been sick with ‘Delhi belly’ since Norbulingka 5 days ago. The violent worst part only lasted for 12 hours but the last 4 days has been a strict diet of banana lassi, toast, and plain rice. My stomach can’t handle anything else. The good part is that I feel ‘cleansed’ and ready for 5 days of yoga and singing. Love & Peace to All. Om mani padme hum. P.S. The photo of H.H. Dalai Lama was taken by William Gilbert who is traveling with our group.